Just a few weeks prior to this incident, the disciples were trembling for their lives as their Lord was arrested and then crucified. They had all fled in the Garden of Gethsemane and then Peter, whose boldness was legendary, had denied him three times. The fact that they had been serving with Yeshua (Jesus) for three years, witnessing many miracles, including Peter's amazing walk on the water, apparently did not inspire the necessary courage to watch for an hour or to stick with Him to the end. Perhaps the miraculous had become a bit commonplace for them, so that when the threat to Yeshua came full force, they floundered and failed miserably. What happened that changed their state of being so dramatically in this encounter with the Jewish leaders? I believe it was two things: one, that they had seen their Lord resurrected from the dead, and two, that they were now filled with that resurrection life and power themselves, by the Holy Spirit. The power of the resurrection was within and upon them! The reality and security of God's indwelling Presence and power, and His words “Be not afraid of them that kill the body, and after that have no more that they can do”, inspired a boldness far beyond any merely human courage. 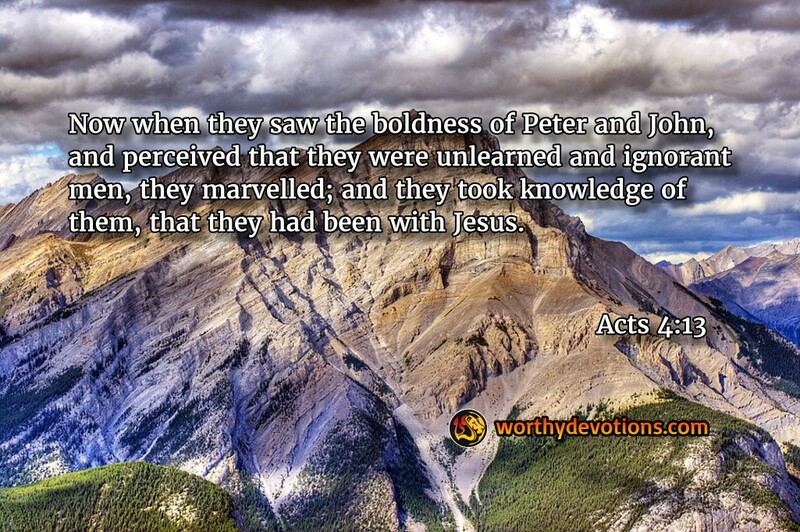 This boldness amazed the Sadducees and Pharisees who despised Peter and John as "unlearned and ignorant"men. They marveled at the unabashed fearlessness of the apostles whose knowledge was of a different and superior kind: the knowledge of their RISEN and RESURRECTED Lord. And then they noted, that these men had been with Yeshua (Jesus)! This power is yours, and it is mine, if we continue to be filled with the Holy Spirit, not quenching or grieving Him. We, too, will confound and amaze the "authorities" of our day with the holy boldness of resurrection life, and though they may despise our humble circumstances, they also will take note that, "we have been with Jesus". i think the "fact that the apostles were afraid and flee as the soldiers captured Jesus and eventually crucified Him" is part of the Lord's plan to show us some things: one, is that we are only human and without the Holy Spirit we cant be a witness for Him. and second, that Jesus ALONE can save us through the cross .if peter, or the other disciples didn't flee and went with Him all the way to His death, i think they will be crucified with Jesus as well (and there will be more than 3 crosses on the Calvary). but because "there is no other name under Heaven given among men, whereby we must be saved" Acts 4:12. Jesus have to do it ALONE, as sad as it sounds, it is the greatest victory of ALL time. Many thanks for your Devotional BUT was just wondering why there wasn’t a Devotional for everyday on your actual Site?.. And “I don’t mean this to be rude” but I was thinking “for those who find it hard to find the words” that it would be nice to end the Devotional on a Prayer?!. Blessings and love to you in Yeshua Our Messiah.